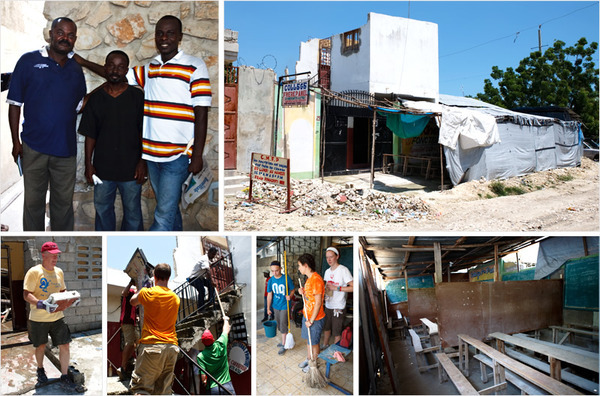 During the first week of August, Chad and I were in Haiti on a mission trip with 14 students and 4 other adults with Adventures In Missions. As I've mentioned, it was the most powerful and meaningful week of my life. Because of what God accomplished in, around and through our group, I've been processing and writing my response to those experiences here on my blog. This is response #2 of 9. You may want to start from the beginning if you're just jumping in. 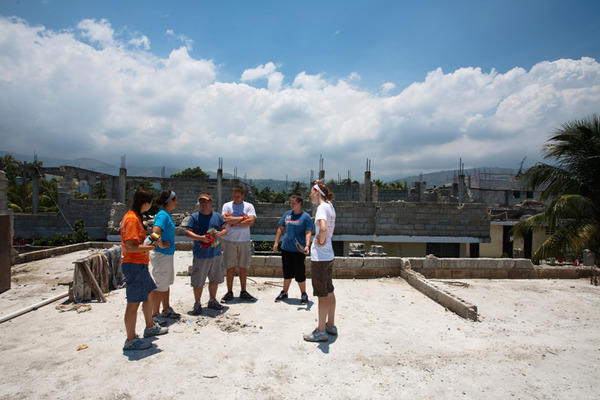 This post is regarding what we actually did while in Carrefour, Haiti. We didn't actually have an "in-stone" plan when we got there. Each day ended up being very different. We started out with a focused time where we simply asked God, "What do you want us to do today? Where should we serve? Who needs our help?" We felt lead to do all sorts of ministry—in the process of being obedient to God's call, we met some felt needs, met some amazing people, and were each stretched on personal levels as we ventured outside of our comfort zones. Our church members and friends had generously donated more than 20 full suitcases of supplies we took with us to hand out (including flip-flops, t-shirts, soap, blankets, school supplies and soccer balls). We were able to distribute each of those items to families/people we got to know throughout the week, to an orphanage we spent time at, to our translators and their families, and to the local church we were partnering with. Plus, most of us ended up leaving almost everything we had brought with us. It was neat to be able to give our air mattresses, clothes and toiletries to the people we had met with those specific needs. They were so grateful—to God be the glory. Please pray for God's continued provision of basic supplies to the people of Haiti. On Monday, Chad and a few others met a man named Pierre while they were out in the community. Pierre (pictured above in the blue polo shirt), his wife and their 4 children were living in the school that Pierre runs. The school had been severely damaged by the earthquake; the second floor classroom level was completely destroyed. Pierre invited them in and they began to learn about his life and his ministry. He showed them how they had made some temporary classrooms leaning against the outside of the building (bringing their new total to 9 classrooms), but with more than 130 students (K-12) enrolled and 30 teachers, they were busting at the seams and were trying to get ready for session again in September. On Wednesday, after a time of prayer, Chad felt God was leading our group back to Pierre's school to assist him and his family/staff. We weren't sure what Pierre would need, but after we arrived and Chad told him we believed God brought us there to help him that morning, Pierre accepted our offer. He asked the boys in our group to help remove the rubble while the girls cleaned the main floor. As it turns out, there was an organization who was coming in the following week to rebuild the second floor—without our 20-person clean-up crew, they would not have been ready. God's timing is so perfect! After hearing about more of the needs for his school, we went back to deliver a suitcase full of school supplies. Pierre was overjoyed! How humbling to realize that God chose to use a small group of students from Wisconsin to fulfill his plan 1900 miles away in Carrefour. Please pray for continued encouragement and motivation for Pierre and his family. Lift up his 30 teachers and pray for funds to come so Pierre can compensate them for all they do. May Pierre's school be a positive place of learning and development for children of all ages. The average Haitian salary is $480 per year (assuming you have a job—we only met a few working people). This makes Haiti the poorest country in the entire Western Hemisphere. Their food staple, rice, costs 20 American dollars per 50 lbs. Again, thanks to the generosity of family and friends before leaving, our group was able to purchase 1100 lbs. of rice and 300 lbs. of beans when we got there. When separated into smaller bags, this provided a couple weeks worth of food for 82 families at Pastor Manny's church, a handful of families we had met in our neighborhood, as well as 300 lbs. for the orphanage we visited. Please pray daily for Haitians to find food for their families. Pray for strength for the hungry. People around the world, outside of our sheltered (ignorant?) American borders are struggling to eat and provide for their families every single day. We flippantly say things like, "I'm so broke right now" or "We have no food left in our house", but what we really mean is, "I usually have so much more than this" or "I need to go back to the grocery store". What could our money do if we re-purposed it once in a while (even if for just a month)? Read the next response (#3 of 9).